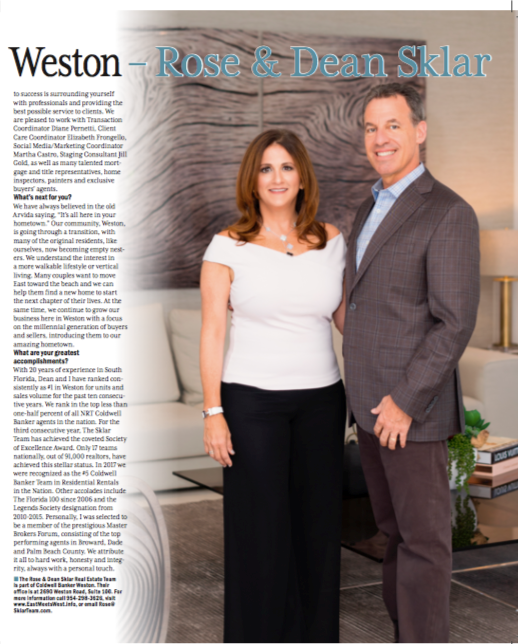 When it comes to the local residential real estate market, “Nobody knows Weston” like Rose and Dean Sklar. In fact, that’s the couple’s motto. They know this city because they live and work here, and it is this first-hand knowledge that has led the dynamic duo to be the top producing realtors in town for the past ten consecutive years. Rose Sklar answered some commonly asked questions about how the Rose & Dean Sklar Real Estate Team can help you with your buying or selling needs. "We love what we do and enjoy helping families find that perfect home. When you work with The Sklar Team, we treat you like family." Your motto is “Nobody Knows Weston Like We Do!” What is the significance of this? We decided early on to focus our efforts on a niche market. There can only be one market leader in any field and we feel that our consistent proven results speak volumes to not only our love for the City of Weston, but to our loyal customers and repeat referrals, that we know this market so well. We love the slogan so much, we actually had it trade- marked years ago. Why is this community so important to you? We’re passionate about selling Weston because it’s our home. We raised our kids here – both of whom were able to go to A-rated public schools. We believe in giving back and are both very active in the community. We support Cypress Bay High School as sponsors and with college scholarship donations. We hold a special place in our hearts for the arts, and I am now serving as Vice President of Ways and Means for the Weston Philharmonic Society. Dean coached YMCA sports when our kids were younger. In addi- tion, we donate a portion of sales to the Coldwell Banker Cares Foundation. What services do you offer sellers? Visual is the name of the game in real estate. We provide professional pho- tography and innovative social media marketing to showcase your home in the best light. Aerial shots, videos, print advertising and impactful copy are all tools at our disposal to maximize results. Through Coldwell Banker we have access to 925 websites with international reach. We price to generate the most interest, most offers and, ultimately, most money for your listing. We leverage our elite status and expansive network to host exclusive, invitation-only broker opens, attended by a select group of top Broward and Dade realtors. What types of marketing support do you offer clients? We craft a unique strategy for all of our properties. Our aggressive marketing platform includes social media, landing pages, strategically-placed Facebook ads coupled with old-school magazine and direct mail advertising. Using thorough research and consideration of market trends, we direct our marketing dollar with a focus on finding the ideal buyer for the listing. In addition, our team of professional stagers prepare proposals to help make the home look its best, includ- ing complete revamping to minimal “face-lift” staging, all designed to net the best return on investment. You and Dean are partners in business and life. How do you make that work? What is The Sklar Team’s story? We formed our team back in 2001 when we moved to Florida from New Jersey. We have always believed that the secret to success is surrounding yourself with professionals and providing the best possible service to clients. We are pleased to work with Transaction Coordinator Diane Pernetti, Client Care Coordinator Elizabeth Frongello, Social Media/Marketing Coordinator Martha Castro, Staging Consultant Jill Gold, as well as many talented mort- gage and title representatives, home inspectors, painters and exclusive buyers’ agents. We have always believed in the old Arvida saying, “It’s all here in your hometown.” Our community, Weston, is going through a transition, with many of the original residents, like ourselves, now becoming empty nest- ers. We understand the interest in a more walkable lifestyle or vertical living. Many couples want to move East toward the beach and we can help them find a new home to start the next chapter of their lives. At the same time, we continue to grow our business here in Weston with a focus on the millennial generation of buyers and sellers, introducing them to our amazing hometown. With 20 years of experience in South Florida, Dean and I have ranked con- sistently as #1 in Weston for units and sales volume for the past ten consecu- tive years. We rank in the top less than one-half percent of all NRT Coldwell Banker agents in the nation. For the third consecutive year, The Sklar Team has achieved the coveted Society of Excellence Award. Only 17 teams nationally, out of 91,000 realtors, have achieved this stellar status. In 2017 we were recognized as the #5 Coldwell Banker Team in Residential Rentals in the Nation. Other accolades include The Florida 100 since 2006 and the Legends Society designation from 2010-2015. Personally, I was selected to be a member of the prestigious Master Brokers Forum, consisting of the top performing agents in Broward, Dade and Palm Beach County. We attribute it all to hard work, honesty and integ- rity, always with a personal touch. The Rose & Dean Sklar Real Estate Team is part of Coldwell Banker Weston. Their office is at 2690 Weston Road, Suite 100. For more information call 954-298-3626, visit www.SklarTeam.com or email Rose@SklarTeam.com.